In addition to the Calendar and Planning Horizon settings configurable from the Planning & Dispatching screen itself, there are additional advanced options available. Service Call Mappings If applicable, here you can input the default statuses to be communicated from Planning & Dispatching to the Enterprise Resource Planner (ERP) in the backend. Assignment Settings Here you can input the default travel time and service call duration defaults which reflect on the Planning Board when scheduling service call activities. Dispatcher Reminders Here you can create reminders for dispatchers based on Service Call Types. Reservation Settings Here you can manage the reservation types that are displayed when scheduling (example: On Call Service = green), to make the application more visually intuitive. With these settings, you can map statuses used in the Enterprise Resource Planner (ERP) system and Coresystems Field Service Management. These statuses will reflect in the Service Calls tab. Ready to Plan Dropdown. Select the ERP status you wish to associate with the READY to PLAN status in Field Service Management. Technically Complete Dropdown. Select the ERP status you wish to associate with the CLOSED status in Field Service Management. Cancelled Dropdown. Select the ERP status you wish to associate with the CANCELLED status in Field Service Management. T&M Journal Locked Dropdown. Select the ERP status you wish to use for the T&M Journal when effort, material, mileage, and equipment information can no longer be added for a service call/activity. From the Default Settings, you can define the default options to be used when new service calls are created. Default Origin Here you can define the default service call origin (example: email). Default Problem Type If applicable, the default problem call (example: repair). Default Priority The default priority level assigned to the service call. Options include: LOW, MEDIUM, and HIGH. 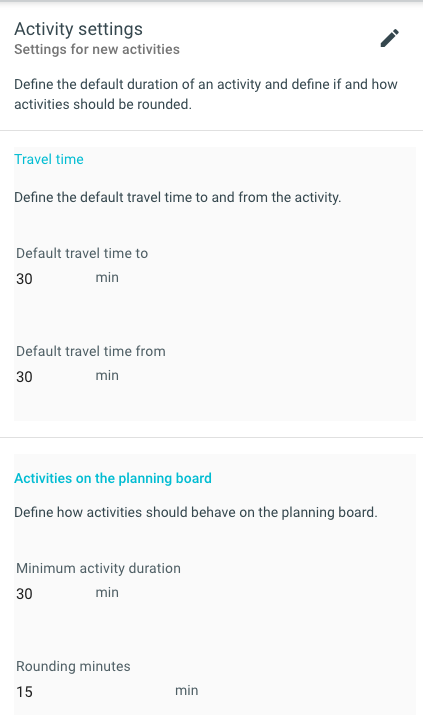 From the Activity Settings, you can define how activities behave on the Planning Board. Default Travel Time to Here you can set the default travel time to the service call destination. Default Travel Time from Here you can set the default travel time from the service call location to the next destination. Minimum Assignment Duration Here you can set the minimum service call time default (example: 60 minutes). When you drag-and-drop assignments onto the Planning Board, they will then reflect this unless you manually expand or change the time range. Rounding Minutes Here you can send the amount of time for which assignments will be rounded (example: 15 minutes). Allow Editing of Closed Assignments By selecting, you will be able to open and edit assignments that have been marked closed. The Dispatcher Reminders settings are used to create reminders for dispatchers regarding service calls and/or its related activities. 1 For a service call that falls into the Planned Maintenance category you could create a reminder for the dipsatcher to contact the customer three months beforehand to make an appointment. 2 A second reminder could then be created that prompts the dispatcher to contact the customer one week before the scheduled appointment to remind the customer of the appointment. 3 A third reminder could be an internal reminder to prepare the equipment. 4 A fourth reminder could be an additional internal reminder to plan the necessary resources. The reminders contained in this example would then improve planning and preparation activities and, ultimately, improve the outcome of the service call. Service Call Type Dropdown. A predefined list of service call types. Examples include: inspection, shut down, planned maintenance. Reminder The text reminder that will be included in the reminder to the dispatcher (example: “Contact customer three months before to make appointment”). The Reservation Types settings is used to define the types of reservations that will be available in the scheduling view and assign them coresponding colors that will display in the indicator. Reservation Type Dropdown. A predefined list of reservation types. Color Color picker. Here you can select the color to be associated with the selected reservation type, making it more visually intuitive. These colors will then display for corresponding reservations on the Planning Board. Time/Date formats can be managed and modified in the Company Settings tab of the Admin module. The company setting used to manage valid date and time formats is the CoreSystems.CoresystemsFSM.Global setting. Valid date and time formats can be defined in this setting. These formats will then be used in the web applications (Planning & Dispatching, Smartforms & Intelligent Feedback, System Events, Master Data Management). This helps to adjust the web interface to the local requirements. Valid Date/Time formats are expressed in JSON format. The following example shows how valid date formats can be expressed in JSON format. The following example shows how to change the time format displayed in the application to use the 12-hour clock convention (e.g. 10.00 am, 03.00 pm). This is acheived by using a placeholder (a). The number of technicians displayed in the Planning Board of the Planning & Dispatching app can be managed and modified in the Company Settings tab of the Admin module. The company setting used to manage the number of displayed technicians is the CoreSystems.ResourcePlanner.MaxNumFilterTechnician setting. By default, the maximum number of displayed technicians is set to 40. Attention: Changing the default company setting (max = 40 technicians) may result in application latencies. The CoreSystems.ResourcePlanner.AssignmentStatusMaximumOverdueTimeInMinutes company setting allows you to define a maximum overdue threshold for activites that have been Released but have not yet been Closed. Maximum 24 (hours). The maximum is 24 hours regardless of company setting.